Usage: Almost any for Home Decor Purpose like- Tapestry, Wall Hanging, Bedspread, Wall Decor, Wall Art, Bed Cover, Room Divider, Curtain, Table Cloth, College Dorm, Picnic Blanket, Beach Throw and For Gifts. 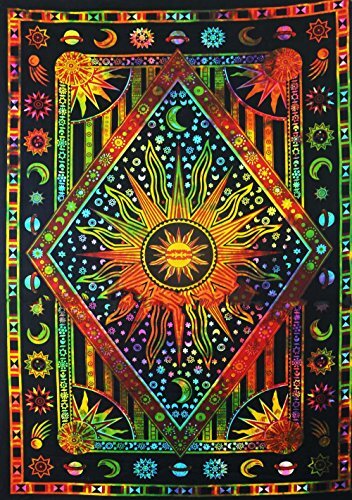 This tapestry can be used for a wall hanging, a table cloth, a bed spread, furniture throw, curtains, altar cloth, hung from the ceiling, home decor, dorm decor and more. MADE IN INDIA- 100% Cotton, made & printed in India. Size - 84X 52 Inches. Color- Multi, Design- Mandala. A wonderful example of Indian craftsmanship. If you have any questions about this product by Jaipur Handloom, contact us by completing and submitting the form below. If you are looking for a specif part number, please include it with your message. ChezMax Mandala Hippie Bohemia Square Polyester Tapestry Multi Purpose Decorative Wall Hanging Mural Art Purple Flower Pattern 79" X 59"